The most extreme manifestation of the war on the poor is the abandonment of people on the streets. Toronto’s shelters are routinely over 90% full even though we fought for and won a City Council commitment to stay below that number. The conditions are overcrowded and often there are bedbugs and illness spreads easily. Rather than deal with the crisis, the city made the volunteer-run Out Of The Cold program and the added several warming centres during the winter months. We have challenged the John Tory administration over shelter overcrowding and the deaths of homeless people with actions at the Mayor’s office and a camp out in front of his luxury condo. The City has been forced to put more resources forward but the shelters still fail to meet basic standards of adequacy and the homeless crisis worsens in this City. We are fighting for better shelter conditions, 1,000 new shelter beds and low-barrier shelters so people who have difficulty with the rules and routines of the shelter system can access beds. In Toronto, a city of wealth, the rich are transforming the downtown into an unaffordable and hostile place. We oppose by-laws that turn poor people into criminals simply for living and sleeping outside. We fight City policies that displace and forcibly move poor people. We confront cops who harass, beat and kill poor people and Black, Indigenous and people of colour. 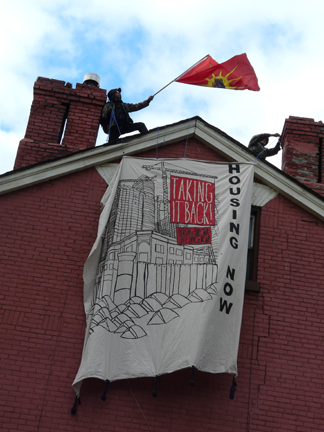 We are sick of being pushed, priced and policed out of the city and refuse to retreat. The primary front in the battle over the streets in Toronto for OCAP is the Downtown East End. Instead of meeting the needs of the poor and homeless downtown, those in power are looking to drive them out. Many hostels/shelters have been closed, beds and meals cut and people forced onto the streets. It is the developers, business associations and suchlike who press for a policy of sweeping homeless people under the rug. They don’t want their money making to be interrupted by destitute people seeking the basic necessities of life. 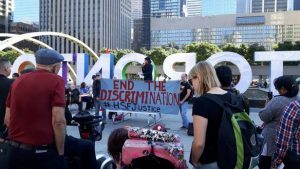 OCAP organizes to fight this harassment and for services to stay in the downtown core. We are fighting to keep the services that exist in the neighbourhood and for more and better services. Rooming houses are disappearing into the claws of developers’ cranes and we are fighting to protect them and get more housing in the neighbourhood. We also fight for space for homeless people in public parks. We took on the St. Lawrence Market BIA (Business Improvement Area) when it hired private security to police St. James Park. We got the security out of the park! We have also held safe parks and tent cities in public parks where we help protect homeless people from the harassment of the cops while they sleep in the park. OCAP is fighting for a decent income for people on social assistance (Ontario works and ODSP – Ontario Disability Support Program). In Toronto, the average rent for a bachelor apartment is $962 while a welfare cheque is a mere $721 in total. 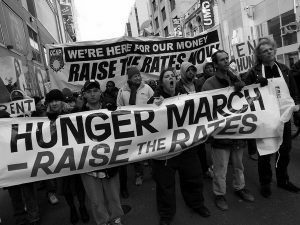 Rates are unlivable. 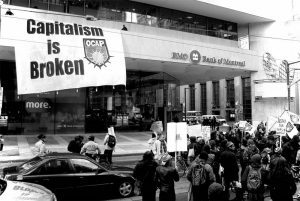 Ever since the Mike Harris Tories cut Ontario’s social assistance rates by 21.6% and allowed then to continue to fall against inflation, OCAP has had a major focus on demanding a major increase in the rates. 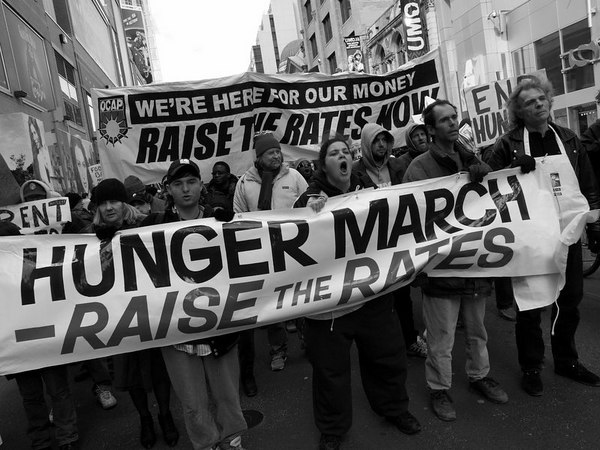 In 2010, CUPE Ontario decided to join with us in this fight and the Raise the Rates Campaign gathered momentum. We campaigned across the Province when the Liberals announced they would cut the vital Community Start Up and Maintenance Benefit (CSUMB) in 2012. 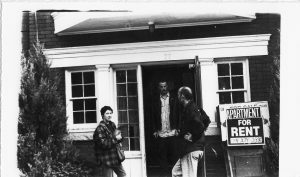 This vital support to those seeking to obtain or retain housing was downloaded to the municipalities but our struggle led to $54* in funding being restored to the program. Raise Social Assistance Rates Now to at least the Basic Income Pilot rates ($1416 & up for OW and $1916 & up for ODSP) with existing supports intact. Stop Cuts to Benefits and Supports and reinstate the Community Start-Up and Maintenance Benefit. 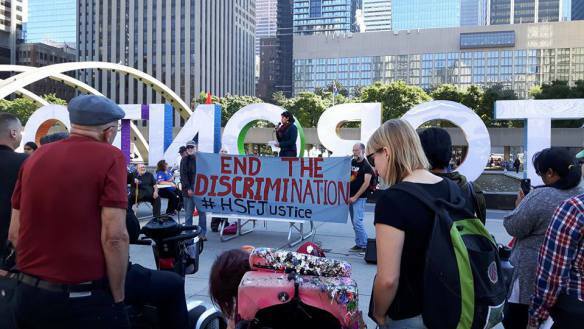 Provide accessible supports with dignity: Eliminate the punitive surveillance from the administration of social assistance so that workers can better provide necessary and comprehensive services. 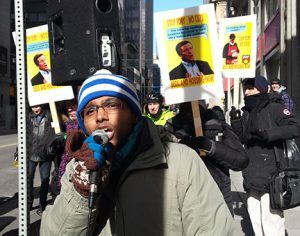 Expand access to all immigrants: Everyone in Ontario who needs social assistance should get it, regardless of immigration status. Support the passage of Bill 148 that ensures the minimum wage in Ontario is raised to $15 an hour by January 1, 2019 with an amendment to remove exemptions to any sub-minimum wages for students and liquor servers. As the notion of replacing present income support systems with one form or another of basic income has gained ground, OCAP has developed an analysis of this approach. We take the view that basic income (BI) is being prepared as a neoliberal measure that would provide a means tested wage subsidy to low paying employers that would be paid for by other social cutbacks. We also conclude that notions of a progressive and truly adequate BI, are unrealistic and, in practice, are providing legitimacy for the neoliberal reality. We have written a number of articles on his and are working with Socialist Project to put out a pamphlet. We have spoken at a wide range of events on this, including participating in a debate organized by the LEAP Manifesto and at a conference in London, UK, held by Disabled People Against Cuts (DPAC) As the pilot projects for basic income are unfolding in a range of places, including Ontario, we will increase the challenge to this neoliberal trap and build solidarity in the face of it on the basis of demanding decent income, free of bureaucratic intrusion. The Housing Stabilization Fund (HSF) is money that people on social assistance can get for emergency housing needs like last month’s rent, arrears or furniture (to establish a home or for bedbugs). The city had a policy that discriminated against families and disabled people and we fought that and got the rules changed! It also had a massive surplus and we fought to get the rules changed so people would get more money and we did. We are still fighting for people to get access to the fund and for more money to be put into it. Click here for the city’s Housing Stabilization Fund policy. The demand for the right to housing has always been a big part of OCAP’s work. Presently, we are working on a Canada wide action to demand the Trudeau Government spend the $11 billion on housing that it has promised but back loaded so we won’t see the money for years. We demand that that money go to social housing, not housing allowances that subsidize private landlords. Toronto has a housing wait list of more than 181,000 on Toronto Community Housing’s waiting list; yet, the city is planning on closing units. 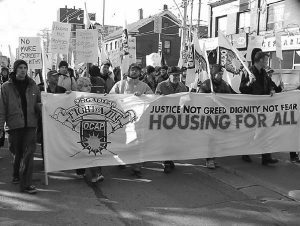 We have also held actions and taken up campaigns to successfully challenge the shameful lack of repair in public housing in Toronto. Social housing is in crisis but the last three decades have seen the defunding social housing by all three levels of government. Instead of creating rent geared to income units where tenants pay 30% of their income like they do in Toronto Community Housing, there has been a shift towards “affordable” housing. “Affordable” housing is defined as 80-100% of the average market rent in any given municipality. 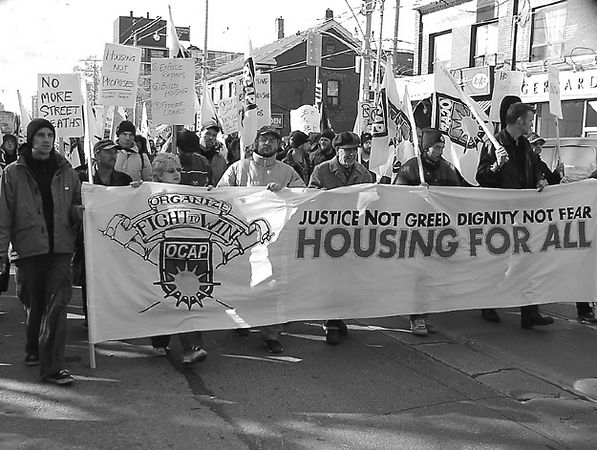 In Toronto Welfare cheques fall below the definition of “affordable” – foreclosing housing options to people living in deep poverty. We are fighting for 75% of all affordable housing units created in Toronto to actually be affordable to people on welfare. Direct action casework is one of the ways that we help fight for what we need. We have been helping people on social assistance with welfare and ODSP problems for years. We help people face their workers when they are getting cut off and when they are being paid less than they deserve. Whether this means bringing 20 people to pound on the doors of Metro Hall, or talking to a worker on the phone, we’re game. In a world where people have fallen upon social assistance as their only means of survival, we fight with pride to ward off the bullies at the welfare/ODSP office. OCAP’s strategy of direct action casework has been so successful that we rarely have to do case actions. 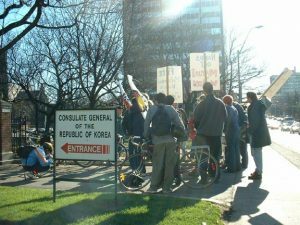 Welfare and ODSP usually just give what people are entitled to because they don’t want a group of people to go and disrupt their office. We do have to go down to offices sometimes and when we do, the more people who can come, the better. You can visit our links page for legal clinics and other resources if you have an non-social assistance issue you need help with. OCAP is located on the traditional territory of the Huron-Wendat, Petun, Seneca and, most recently, the Mississaugas of the New Credit peoples. We do not believe that justice can be achieved in Canada without addressing and reconciling our colonial past and present. Canada’s wealth is built off of the backs of Indigenous people and because Indigenous people are disproportionately poor and homeless. Capitalism and colonialism are intricately connected and we cannot defeat one without defeating the other. 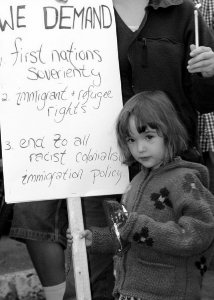 We work to decolonize Canada and in solidarity with Indigenous communities. 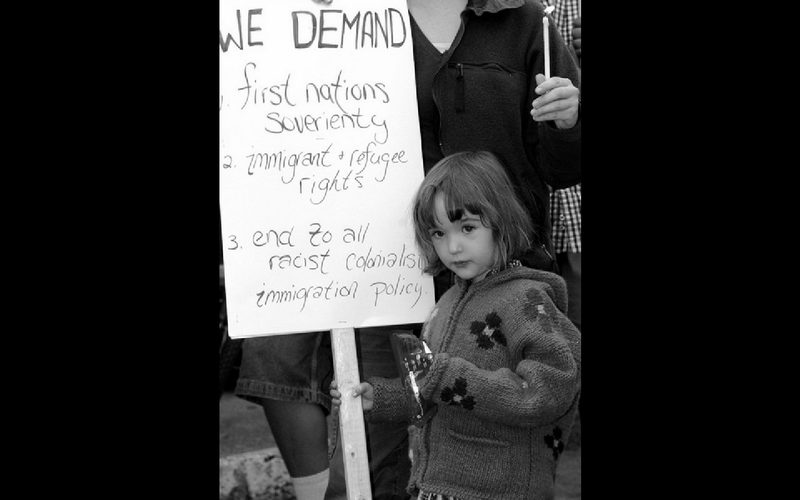 We support self-determination of First Nations and Inuit communities on Turtle Island. We understand ourselves to be part of a broader struggle for global justice. At times, we take action in support of other poor people around the world. We have done direct actions in support of a number of groups including: people living under Israeli occupation in Palestine, disabled people fighting against institutional abuse in Greece, people who created a tent city in Japan, those who took a squat in Ireland, workers in Korea, political prisoners in the United States and Indigenous people in Mexico, among others.